If there’s one thing a sugar addict does not need to learn, it’s how to make doughnuts. It’s like teaching a pyromaniac to make fire by rubbing two sticks together. Which is precisely why I enrolled myself in the recent doughnut class at King Arthur Flour. Despite my sweets dependence and love of all things fried, I’ve never had a great desire to make my own doughnuts. I didn’t realize until recently that one could craft those sweet pastry Os by hand without the help of an industrial deep-fat fryer and a heaping mound of preservatives and flavor enhancers. But when I did, I found something exciting about the possibility of being able to feed my own addiction. 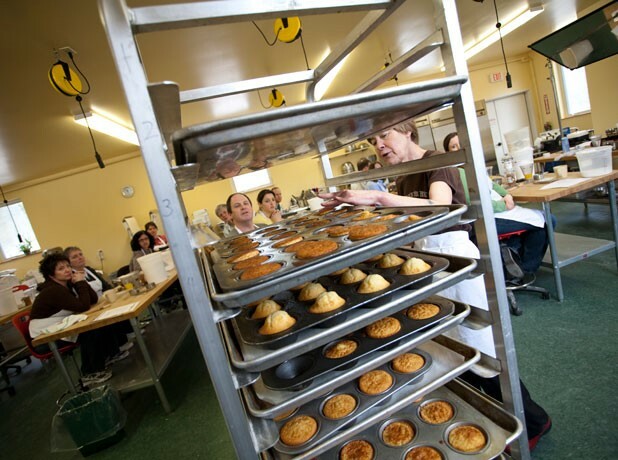 King Arthur Flour offers about 300 classes a year at its 10-year-old Baking Education Center in Norwich. Over the past year, more than 3000 students have sought knowledge from the company’s baking sages. Courses cover topics ranging from puff pastries and crêpes to baguettes and sourdoughs. The center’s doughnut class is a perennial favorite. My class of 16, intriguingly titled “Donuts: Not Just for Breakfast!”, is sold out well in advance. I am lucky to get in. Rosemary Hubbard, 62, the instructor, is a wiry baker with hands that might as well be lined with asbestos — they’re that desensitized to burning-hot baking pans. Hubbard has certainly earned the right to wear a traditional chef’s jacket after years as head pastry chef at upscale food purveyor Dean & DeLuca. But instead, she sports a T-shirt trumpeting her favorite doughnut shop in the country — Voodoo Doughnuts in Portland, Ore.
Hubbard is serious about doughnuts. “I just never fail to leave a doughnut unturned or uneaten,” she tells the class before we begin baking. Berliners, Hubbard informs us, are Viennoiseries — yeasted baked goods that use added ingredients such as milk, eggs, butter and sugar to make them richer and/or sweeter. Without even tasting the deep yellow dough, we can see it’s fattening. Because the Berliner dough needs to rise, Hubbard whipped up a batch the night before. But she does demonstrate the prep technique. As 16 of us huddle around the wooden table at the front of the classroom, Hubbard shows us how to mix and knead the dough so as not to activate the gluten in the wheat. The lemon oil in the mixture perfumes the air as she works. Once Hubbard has finished with the Berliner dough and set it aside for later, it’s time for the hands-on portion of the class — making doughnut muffins. The plan is to make these little gems from start to finish by ourselves. I admit to my tablemate, Meredith Willett, that I’m nervous. I’m pretty good with canned soup and can fix myself a mean bowl of cereal, but beyond that, I’m a wreck in the kitchen. Willett, who runs Sweet Dreams Bakery from her home in Bradford, assures me I’ll be fine. But she never saw the result of my last attempt at baking — a concrete-like mound of sourdough with a one-way ticket to the compost bucket. Hubbard explains why she chose to teach us to make doughnut muffins instead of traditional holed doughnuts: They don’t require deep frying, making them easier for the home cook to reproduce. Fine by me, since I don’t need a sleeve of sizzled skin courtesy of boiling cooking oil. The first step in doughnut muffin mastery is to sift and mix all the dry ingredients, including pastry flour, which I learn has a lower protein content than regular flour, thus ensuring lighter, fluffier baked goods. With gentle guidance from Willett, who reminds me to read the directions completely before diving in, I successfully accomplish the first task. I feel like I’m in a “Top Chef” kitchen when I look around and see that all my classmates/competitors have already finished creaming the butter and sugar, which Hubbard says can be accomplished at home with a hand mixer. Most have moved on to mixing in the flour. I’m starting to get amped up when Willett, a 32-year-old mother of two, reminds me that it’s not, in fact, a competition. After blending the wet ingredients with the dry, I have a colloidal mixture that I would gulp down like water if nobody were watching. With an ice cream scoop, I dole out little servings of batter into muffin tins. Surprisingly, what I’ve made smells just like a doughnut. Fifteen minutes later, Hubbard and the classroom helpers — King Arthur Flour employees whose job it is to wash dishes and keep track of cooking times — open the bank-vault-like commercial oven that holds the muffins. A toasted-sugar aroma floats over the classroom. Dunkin’ Donuts, Krispy Kreme or any other alliterative doughnut chain, eat your premade pastry hearts out. As they pull out the tins and set them on a rack to dry, I am fraught with anticipation. Desperate to see if my muffins look edible, I venture over to have a peek. Against all odds, my muffins look, well, banging. They are perky, with small, pillowy crowns on top. Noticing some of the more bulbous muffins on the rack, I congratulate myself on my apparent triumph. But not so fast. I still have to remove the muffins from the tin. I turn the mold upside-down, expecting them to fall right out like my neighbor’s did. Instead of popping out like obedient little pastries, they cling to the sides of the tin like obstreperous children. I have to get violent. I slice the edges of the muffins away from their captors and bang the tin on the table. Out come 12 springy golden nuggets. The last step involves drenching the muffins in melted butter and dredging them in a mix of sugar and freshly ground Saigon cinnamon, which Hubbard tells us is cultivated in Vietnam and is more potent than the more common Indonesian variety. Most grocery stores carry both varieties, we’re told. As the muffins cool on the table, they tease me with their shimmery sugar shell. I see no reason why I shouldn’t eat them all right there. But a few bites of the surprisingly rich treats are all I can handle. I need to save myself for the crispy churros and jam-filled Berliners still to come. I’m glad I have exercised self-control, because the other two fried-dough iterations are just as intoxicating to eat, and to make. I could sit in front of the deep fryer for hours watching the churros and Berliners dance in the bubbling oil. Which is why I can never have a deep fryer. The real test of any cooking class is whether students can reproduce the recipes at home without an instructor giving turn-by-turn directions. I’m pleased to report that, with no one reminding me that tablespoons are bigger than teaspoons or that you should always set out your cooking utensils before you begin, I successfully baked a dozen doughnut muffins for a dinner party a few days later. And, miraculously, they were even better than the first batch. Freshly grated nutmeg and a crunchy cinnamon-sugar topping give these muffins all the satisfying flavor of a cake doughnut without the deep-frying hassle. They may not be better for your health, but they will start your day off sweetly. Preheat the oven to 325ºF. Grease 12 muffin cups with baking spray. Sift together the flour, baking powder, salt and nutmeg; set aside. In a standing mixer fitted with the paddle attachment, cream together the butter and the sugar, mixing until the mixture turns white and fluffy. Be careful to scrape down the sides of the bowl so that all the sugar is absorbed by the butter. Add the eggs, and extra yolk, one at a time until fully incorporated into the batter. Add the vanilla. With the mixer set at very low speed, alternately add the flour and buttermilk to the batter in several additions. You should begin and end with the dry ingredients. Fill the muffin molds three-quarters full and bake for about 15 minutes, or until light golden brown and springy to the touch. While the “doughnuts” bake, prepare the brushing ingredients by mixing the sugar and cinnamon in a small bowl. Have a pastry brush handy for brushing the doughnut muffins with the warm melted butter.